March 4 is the deadline for the administration and congressional leaders to reach some kind of agreement before the U.S. government shuts down. According to the Washington Post, the first Clinton-era government shutdown in '95 led to the furlough of about 800,000 federal employees, and the second in '96 furloughed about 284,000. While national security and some other functions continued, national parks closed; phones went unanswered; bureaus stopped processing applications including visas and passports; many federal contracts were frozen; the Centers for Disease Control and Prevention stopped disease surveillance; and toxic waste cleanup projects at 609 sites were halted, causing the furlough of 2,400 Superfund workers. If the same agencies close their doors during the possible March 4 shutdown, cleanup will grind to a halt at Brooklyn's toxic waste sites at the Gowanus Canal and Newtown Creek. The Gowanus Canal "is heavily polluted with PAHs, PCBs, heavy metals, and sewage," according to the latest EPA report. 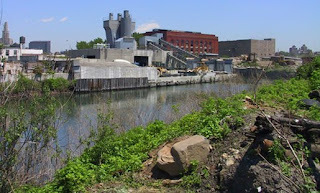 On March 8 at 6:30 p.m., the Gowanus Canal Community Advisory Group, is set to hold its next meeting at the Old American Can Factory at 232 Third Ave. 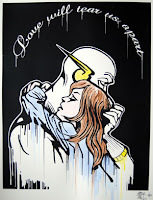 Verge Art Brooklyn opens in DUMBO this Thursday, March 3. The show includes over seventy gallery exhibitors at nine locations -- nearly forty participants for "Material Issue: Artist's Projects Spaces" and fifty artists for "Tomorrow Stars: The Art Brooklyn Open Call Exhibition." 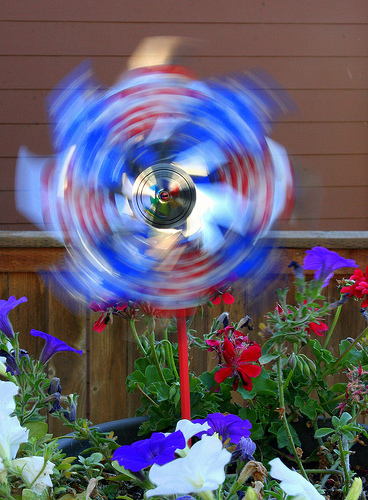 According to Verge, "Tomorrow Stars" represents "the brightest and best Brooklyn has to offer," as selected by Courtney Wendroff of the Brooklyn Arts Council, artist and former president of the NYC chapter of the American Society of Media Photographers Stephen Mallon, blogger and art critic Steve Kaplan, and Danny Simmons, chairman of the NYC chapter of the National Conference of Artists. Opening Night Party is free with Passport Program Booklets; all others $20. Admission prior to 10 pm is free. Party details here. The National Weather Service has issued a high wind warning and special weather statement for the New York City area until 11 p.m. tonight. Expect rain and possibly a thunderstorm with high winds this afternoon and early this evening. Gusts as high as 60 mph are expected to blow down trees and power lines. Bring loose items indoors (construction materials, garbage cans, deck furniture) and avoid driving if you can, especially on bridges and overpasses. 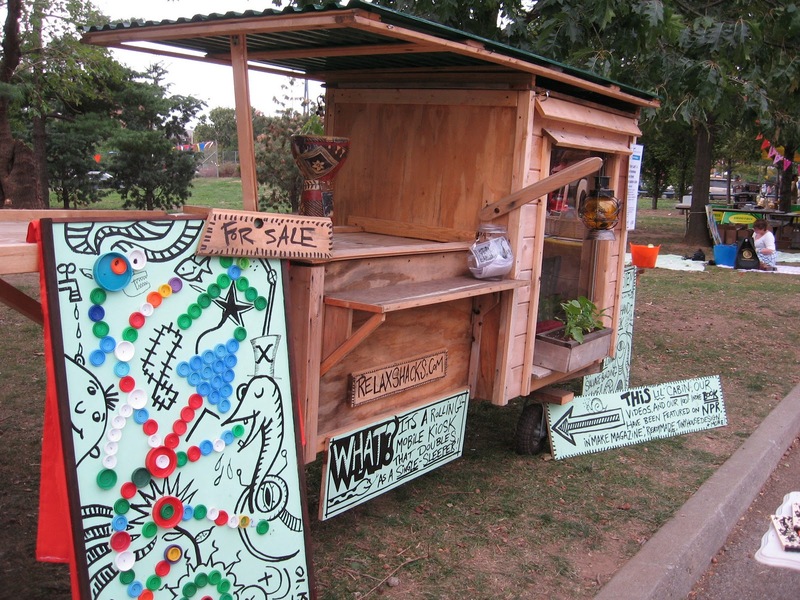 Last September McBrooklyn visited the Maker Faire and was wowed by this teeny house called the "Boxy Lady" made from scavenged wood by Derek Diedricksen. 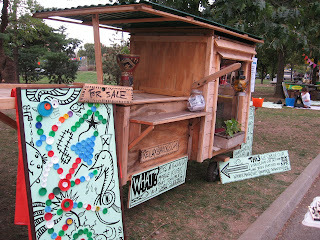 Diedricksen told us that Boxy Lady and his other "microhomes" function as mobile homeless sleepers / street kiosks / and vacation cubes. Today the New York Times published a feature about Diedricksen and his tiny homes, along with a slideshow of his work. It's called "The $200 Microhouse" and it's an inspiring read. It's amazing what Diedricksen can do with a few packing crates and a front-loading washing machine. Yes, the wizards at the TSA are now wanding and groping women and children getting off trains before allowing them to go home. Words cannot express the brilliance of this plan. Simply stunning. You'll Never Be Disappointed by Bacon. Until You Are. A Brooklyn author is suing her former literary agent for allegedly stealing the idea for an “I Love Bacon” cookbook, according to the Brooklyn Eagle. 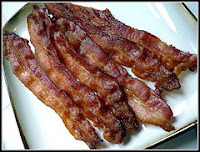 “Whether you crave its flavorful crunch in the morning, the salty taste it lends to a Mediterranean BLT, or the way it transforms Spaghetti Carbonara, you’ll never be disappointed by bacon,”the book's description reads. The outlines of the oval surrounding the ornamental fountain (covered in green) can be seen now in the middle of the 2.9-acre Walt Whitman Park in Downtown Brooklyn (next to the Office of Emergency Management on Cadman Plaza East). The park is undergoing a $4.5 million transformation, which began in April 2010. The design also calls for more trees and a planted median at the Cadman Plaza East entrance. According to the Brooklyn Eagle, four Walt Whitman poems will be engraved in granite on the sides of the fountain, which will double as a children's sprinkler. The city gave the long-neglected park to the feds several years ago for use as a parking lot while the new federal courthouse was being built. In 2007, federal officials promised the city $2.5 million to fix the park up once they were done with it. Work is expected to be completed spring of 2012 (see the Eagle for the rendering). Walt Whitman Park is often called "Red Cross Park" because the OEM building was formerly the Red Cross building. 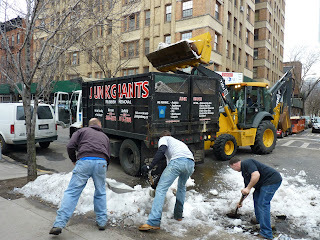 A work crew shoveled up the last big pile of snow on Henry Street on Brooklyn Heights Friday. The next storm is expected to roll through tonight. According to the National Weather Service, 3 - 5 inches could fall in Brooklyn by 2 p.m. Monday. A winter weather advisory is in effect. Get out your hockey stick and rumble down to Red Hook: a full blown Street Hockey competition will be taking over Dwight Street between Van Dyke and Beard Steets tomorrow -- Saturday, February 19, between 11:00 a.m. and 7:00 p.m. The street will be closed to vehicular traffic. A permit has been issued by the Mayor's Street Activity Permit Office to close the street and hold the event. Any questions regarding events held on public streets may be directed to the Mayor's Street Activity Permit Office at (212) 788-7567. 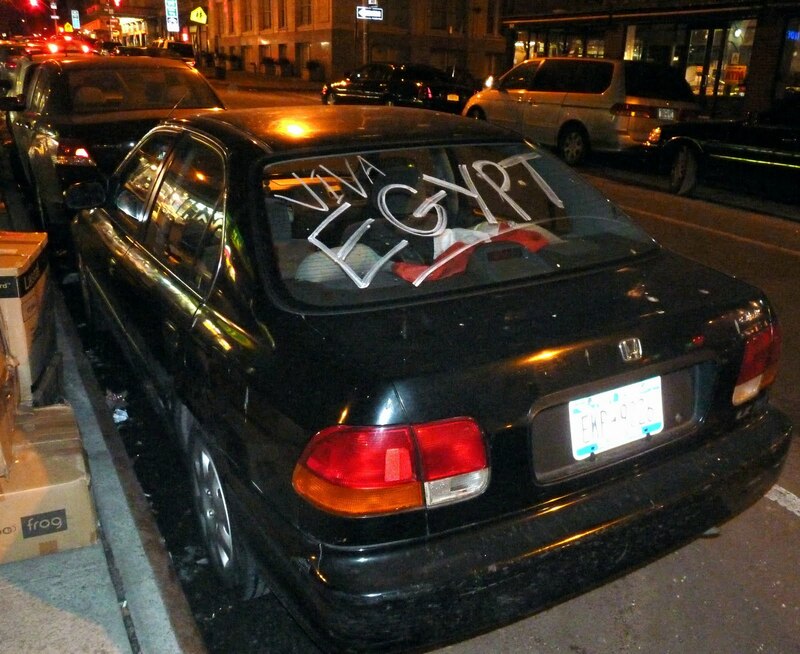 On Henry Street in Brooklyn Heights. A done deal: From the Brooklyn Eagle: The National Park Service on Monday issued a decision that confirms that the Tobacco Warehouse in DUMBO is not "restricted to outdoor recreation" and that "plans to use it as a cultural and community center can continue to move forward." This means that Saint Ann's Warehouse gets to remake the public Tobacco Warehouse into a private performance space (proposed interior above). Two Trees plans to eventually redevelop its space across Water Street into the 17-story Dock Street condo. 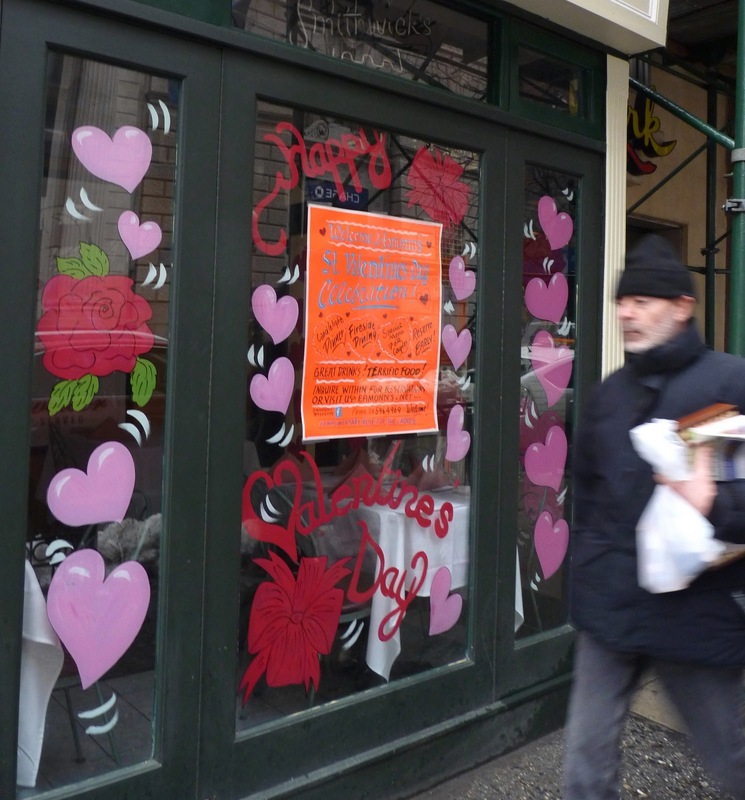 The Brooklyn Heights Association will continue their lawsuit against this "back room" deal, a spokesperson told the Eagle. 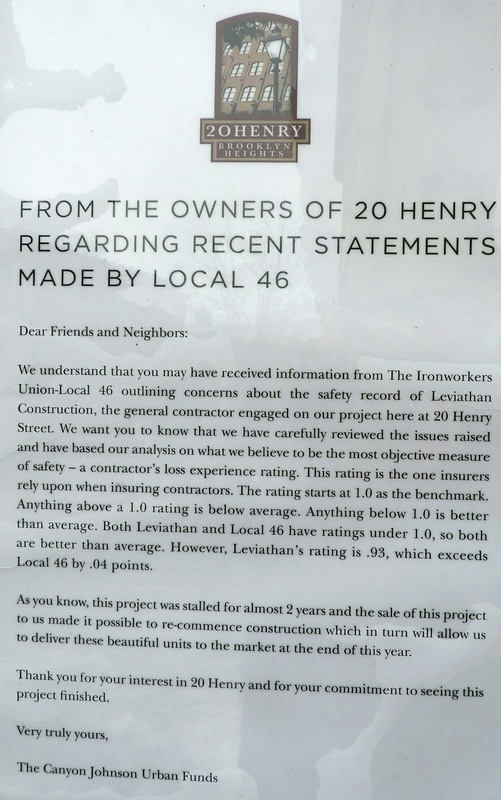 Last week Brooklyn Heights Councilman Steve Levin (and Ironworkers Union Local 46) criticized Canyon Johnson Urban Funds for hiring Leviathan Construction Management to work on 20 Henry Street, saying the company was "irresponsible" and had a bad safety record. 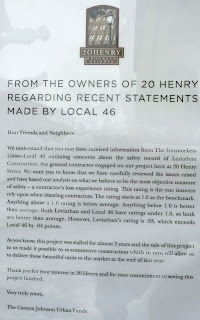 Leviathan faces up to $35,000 in fines at the luxury condo development at 20 Henry, according to the NY Daily News, and has 180 violations at their other projects around the city. Meanwhile, holds your kid's hand when walking by the site: a section of the fence was down yesterday morning. 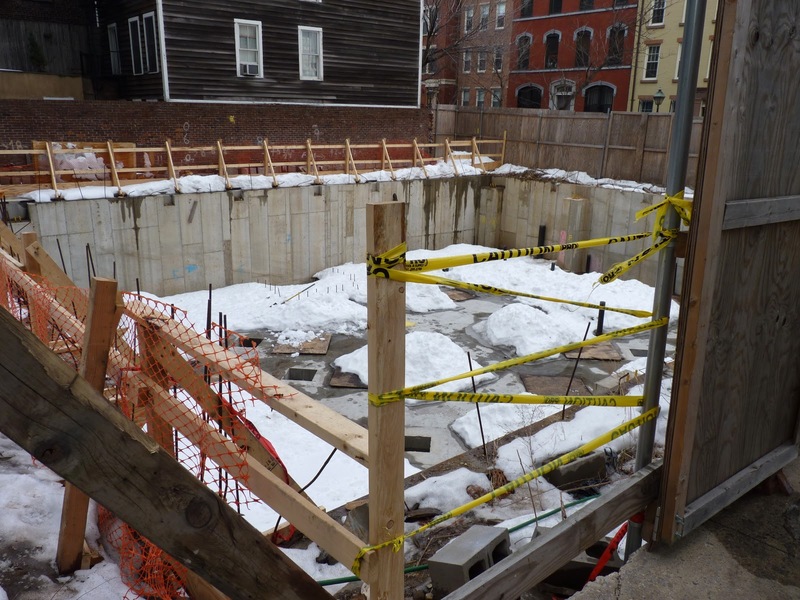 A deep, slush-filled pit, dug for the foundation of the planned second building, is right on the other side of the caution tape. This is safe? We looked around for a worker to ask when the fence would be fixed but no one was around. We'll check back later today to see if the fence is still down. UPDATE: The fence was back up on Tuesday, except for the southernmost section where it touches the building. Could the "suspicious package" found at Floyd Bennet Field yesterday -- which turned out to be a cannonball -- be somehow related to yesterday's scattered reports of "people seeing an object flying over southern Brooklyn, heading in that general direction"??? - Enjoy drinks, tango lessons and dancing in Brooklyn Winery’s Harvest Room, and aphrodisiac cocktail nibbles created by famed chef Sarah Simmons. 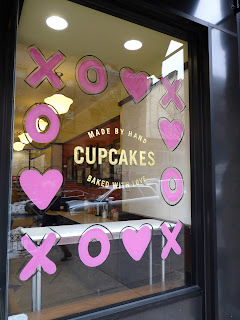 - Enjoy a V-day Staycation and/or dinner at the Grubstake in the Sheraton Brooklyn. The Staycation is $239 night stay, including dinner for 2 (chef-selected menu) in the restaurant. (Drinks are not included in the rate). Only want dinner? $39.00+ per person. - Radegast Hall will be open noon-4am. Don't have a date? WHO CARES!!! Stop by with your friends and Salute to Singlehood! - Make your dinner reservations at Open Table now. 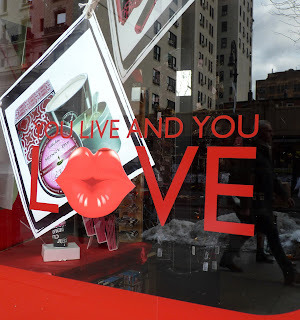 - The Show and Tell Show and more Valentine's events listed at the Brooklyn Eagle. - The Valentine's Day Rejection Show and more events listed at Brooklyn.com. - Map your special Valentine with Google Maps' (see illustration above) Map Your Valentine. 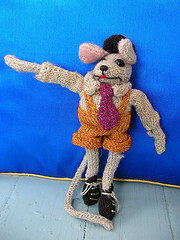 A Gowanus gallery taxidermy class in which dead mice are used to create human-like figurines sold out in 4 hours, and several more classes had to be scheduled. The art form is a "bizarre Victorian hobby that featured mice, squirrels and cats in various forms of dress, the NY Post reports. UPDATE: The merger is back on! LICH is saved (until the next crisis). More here. Donald and Mildred: We're sorry. We're sorry we couldn't fight their lawyers and their back-room deals. We're sorry that the Dept. 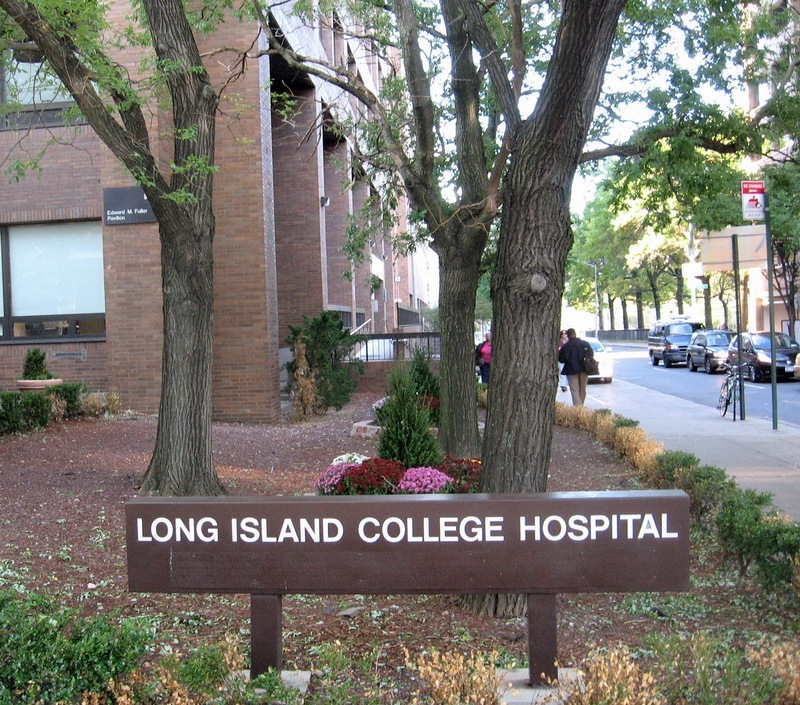 of Health ignored the Long Island College Hospital (LICH) doctors who wanted to testify about what was really going on at the hospital. We're sorry we lost all that damn money, money you gave with good intentions. And if it happens, we're sorry we lost the hospital, too. The $140 million bequest by Brooklyn Heights residents Donald and Mildred Othmer to Long Island College Hospital has been sucked dry by Continuum Health Partners, and now the magical merger with SUNY Downstate that was supposed to keep LICH open appears to be going bad fast, under the steely gaze of Governor Andrew Cuomo. Assemblywoman Joan Millman told the Brooklyn Eagle that state Sen. Daniel Squadron, Borough President Marty Markowitz and Congresswoman Nydia Velazquez, among others, are hoping to set up a meeting with the state to try to salvage the merger. Stanley Brezenoff, president of Continuum Health Partners, told the New York Times that the hospital was “running on fumes,” and would run out of cash by mid-March. At that point he "would be forced to begin bankruptcy proceedings and move forward with closing the hospital and laying off its 2,500 employees." "Under Continuum, the once-profitable LICH has been hemorrhaging red ink by some $1 million a month. 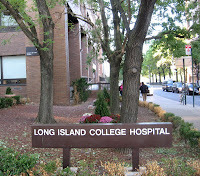 [Dr. John Romanelli, head of the LICH medical staff] says Continuum cannibalized LICH for the benefit of the network's Manhattan mother ship, Beth Israel. Then Continuum dumped LICH in an orphan's basket on the state's doorstep." "I can't imagine that savvy Andrew Cuomo, the likely next governor of New York, is going to let Continuum's back room brokered LICH/Downstate merger happen with a nose-crinkling rubber stamp by DOH." In its Capabilities Report, Continuum, with an annual operating budget of $2.1 billion, says it has "A Business Model With Significant Advantages." Beth Israel in Manhattan has recently acquired a new 64-slice CT angiography scanner, has doubled the size of its emergency room, has launched the Gerald J. Friedman Diabetes Institute, and has undertaken an extensive renovation of 12 inpatient units, along with countless other improvements. Knowing that the Manhattan-bound lanes of the Brooklyn Bridge were scheduled to close for emergency pothole repairs at midnight, savvy drivers headed out of Brooklyn around 11 p.m. Thursday night -- only to get stuck in a massive traffic jam as workers shut down the bridge an hour before it was supposed to close. Traffic personnel made drivers on busy Adams Street turn right (as seen above) onto Sands Street instead of left, onto the bridge. 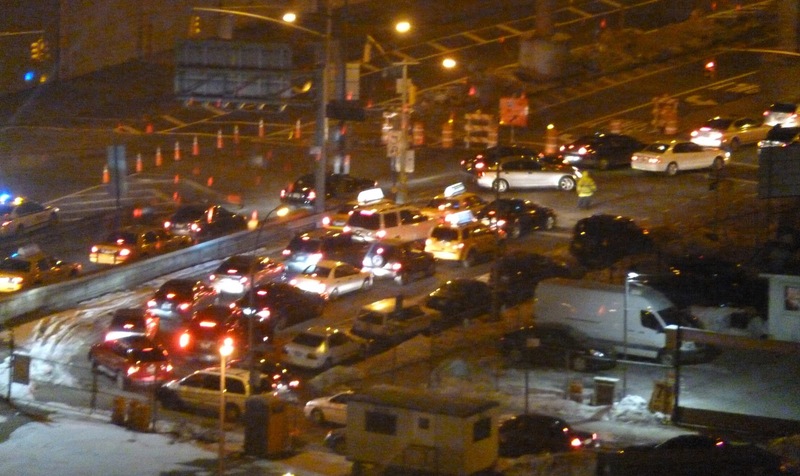 Since Brooklyn-bound drivers were also exiting onto Sands Street (as they were actually driving the wrong way on the Manhattan-bound side of the bridge), it made for total gridlock. So be warned: this whole mess will repeat Friday night, when the Manhattan-bound lanes will again be closed, supposedly at midnight, but really much earlier. And the Manhattan-bound side will remain closed till 6 p.m. Saturday. 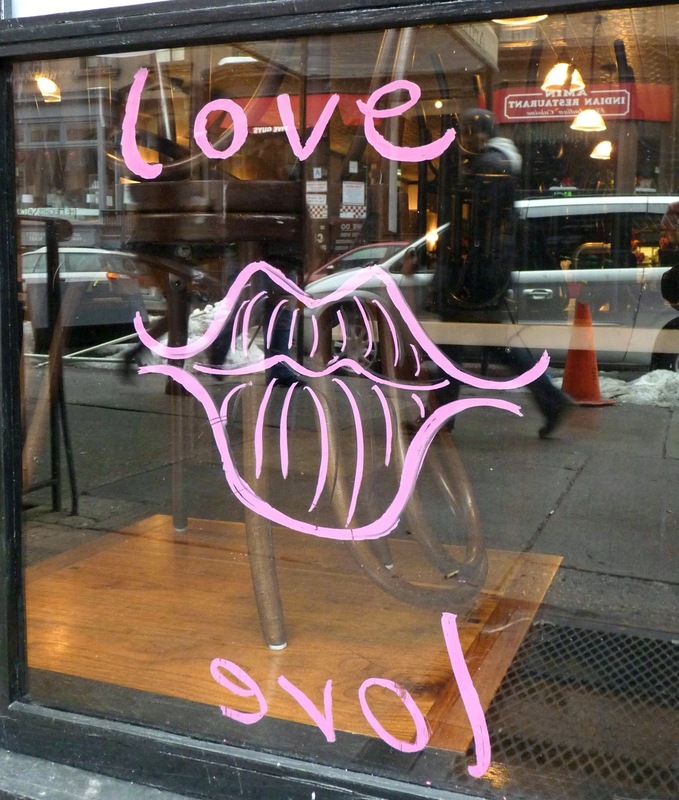 Love may not be in the air but it's certainly on the windows on Montague Street in Brooklyn Heights. Why not take a stroll and get that lovin' feeling? 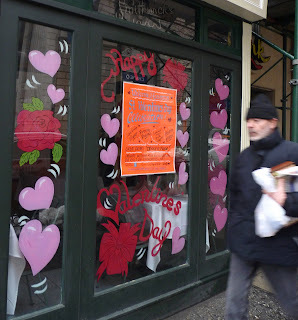 Armando's Restaurant, above, is going with a free-flowing kinda love this year. Crumbs Bakery is handing out hugs and kisses. Ricky's gets right down to it, as usual. 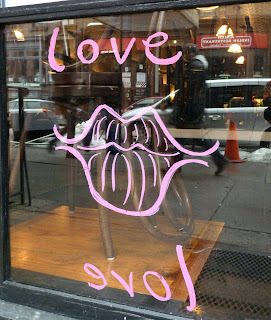 A little more lovin' from Ricky's. James Weir sticks with the classics. But Will Our iPhones Work in May, 2013? Areas of possible power system collapse. Solar Cycle 24 (they repeat every 11 years) will come to its peak in May, 2013, and NASA says we should prepare for power grid trouble. These solar storms usually cause a bit of havoc with electronics, and today our increasingly interconnected power grids acts like "giant antennas for geomagnetically induced currents." "The great geomagnetic storm of 1859, for instance, occurred during a solar cycle of about the same size we’re predicting for 2013," said Doug Biesecker of the NOAA Space Weather Prediction Center, according to NASA. NASA says, "A recent report by the National Academy of Sciences found that if a similar storm occurred today, it could cause $1 to 2 trillion in damages to society's high-tech infrastructure and require four to ten years for complete recovery." Scientists studied what would happen to today's power grids if we experience a solar storm similar to the great geomagnetic storm of May 1921. The model predicted "more than 350 transformers at risk of permanent damage and 130 million people without power" for long periods of time. Regions with a large percentage of "at-risk" capacity could suffer power failures lasting years, according to NASA. On a state-by-state map showing percentages of at-risk capacity, New York Jersey, with 82 percent of its transformers at-risk, carries the highest risk of catastrophic power failure in the U.S.
OK, but what about our iPhones? NASA says, "Radio bursts from solar flares can directly interfere with cell phone reception." Hmnn. A new NASA project, "Solar Shield," is an experimental forecasting system for the North American power grid. The idea of grid protection has kicked around Congress, but funding remains a dicey proposition. Graphic source: J. Kappenman, .Metatech Corp.
Three "prominent residents" who were former officers of the Brooklyn Heights Association (BHA) have resigned from the BHA, the Brooklyn Eagle reports. Hank Gutman, David Offensend and Joanne Witty resigned in protest over lawsuits, supported by the BHA, to prevent the Tobacco Warehouse from being converted into a cultural and entertainment center by St. Ann’s Warehouse. The Eagle says that all three were deeply involved in planning Brooklyn Bridge Park -- and all three are now on the board of directors of the Brooklyn Bridge Park Corporation. The NYC Department of Buildings is advising property owners, builders and contractors to get ready for high winds today and tomorrow. The National Weather Service forecasts wind gusts up to 45 mph for the New York City area Tuesday February 8, through Wednesday, February 9. 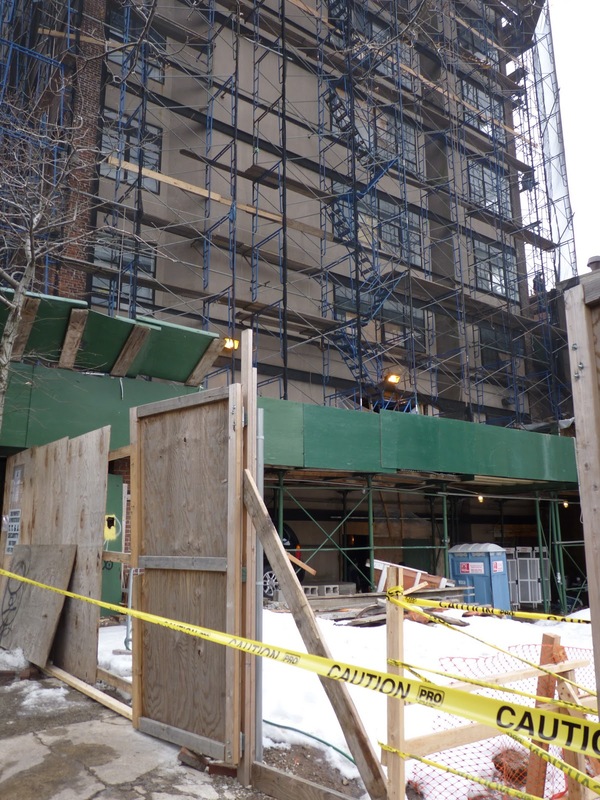 DOB will be performing random spot-check inspections of construction sites around the city. If construction sites are not safely secured, the Department "will take immediate enforcement action with the issuance of violations and Stop Work Orders if necessary." If that's not bad enough, the temperature is going to plunge tonight to a low around 14 degrees. Add the wind and it will feel like 0 or colder. Please join P.S. 321 in a showing of "Race to Nowhere" -- about the "dark side" of America's achievement culture -- at P.S. 321 on Wednesday February 16th. Race to Nowhere is a thought-provoking film about the stress children and teens experience in the high stakes education culture of the United States. The event will start at 6:30 PM and will run approximately 2 hours. This film looks at a host of issues related to the culture of achievement in the United States, specifically through the lens of how school and extra-curricular pressures affect children. It questions the role of parents, schools, and school systems and explores ways in which each can better address the pressures young people often experience. The film was made by a mother in Marin County, California, out of concern for the ways in which pressure to "achieve" was affecting many children, including her own. 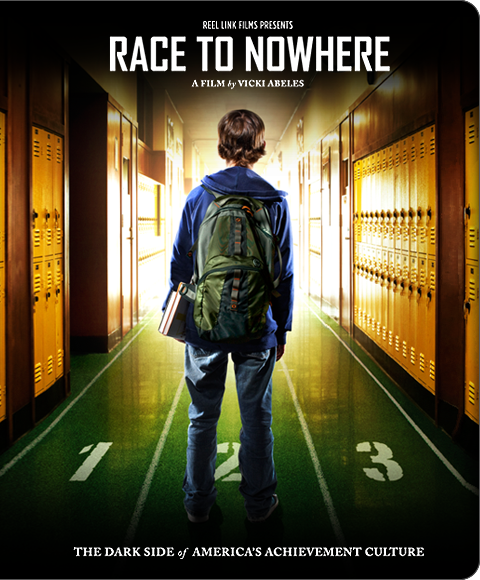 For more info on the film, go to http://www.racetonowhere.com/. Following the film, there will be a panel of experts to answer questions. Tickets cost $10 in advance, available online at http://www.racetonowhere.com/screenings/ps-321 If there are tickets left, they will be sold for $15 at the door the night of the event. The new P.S. 8 Annex, seen above jutting out from the original school building, blends right in on Poplar Street in Brooklyn Heights. It looks like it may even be completed in time for kids to move in next September. Now on to the next problem: According to the Brooklyn Eagle, parents at P.S. 8 are desperate for a middle school and recently passed a resolution calling for their school’s expansion to the eighth grade.They're actively looking for a new school building within walking distance of the elementary school. Many P.S. 8 children have gone on to a Fort Greene middle school, the Urban Assembly School of Arts & Letters, after P.S. 8, but that school will be cutting its enrollment in half soon. 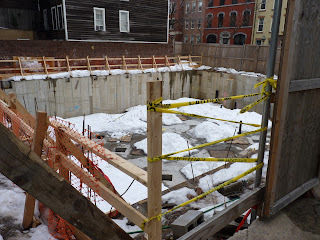 "Since DOE already committed to build an annex at the site, 'Why not try to build P.S. 8 as big as you can?' said Jake Maguire, spokesperson for Yassky. "But School Construction Authority President Sharon Greenberger, at a July press conference revealing plans for the new annex, announced the city’s support for a middle school at Dock Street in DUMBO instead." Well that certainly showed foresight! Two Trees has not even filed permit applications for the Dock Street project yet, according to the Eagle. And as middle schools go, the one planned for Dock Street is small (300 seats). P.S. 8 serves 554 kids now and that number may increase when the annex is completed. When the proposed Dock Street middle school is eventually built, it would be open to students from the entire district, not just the neighborhoods zoned for P.S. 8 which include Brooklyn Heights, DUMBO, Vinegar Hill, the Navy Yard Area and part of Downtown. NYPD officers responded to a shooting around 12 p.m. today at 14 Boerum Place at Livingston (Adams Street turns into Boerum Place), according to the Brooklyn Eagle. It all started when a probation officer came out of the building and saw a man in the officer’s car. Full story at Brooklyn Eagle. 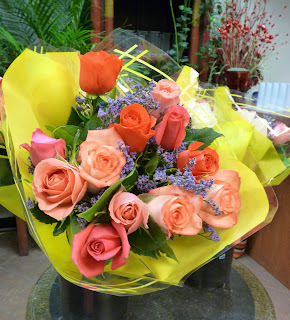 - Valentine's Day on the cheap. Brokelyn And the ideal Brooklyn date weekend at The L Magazine. 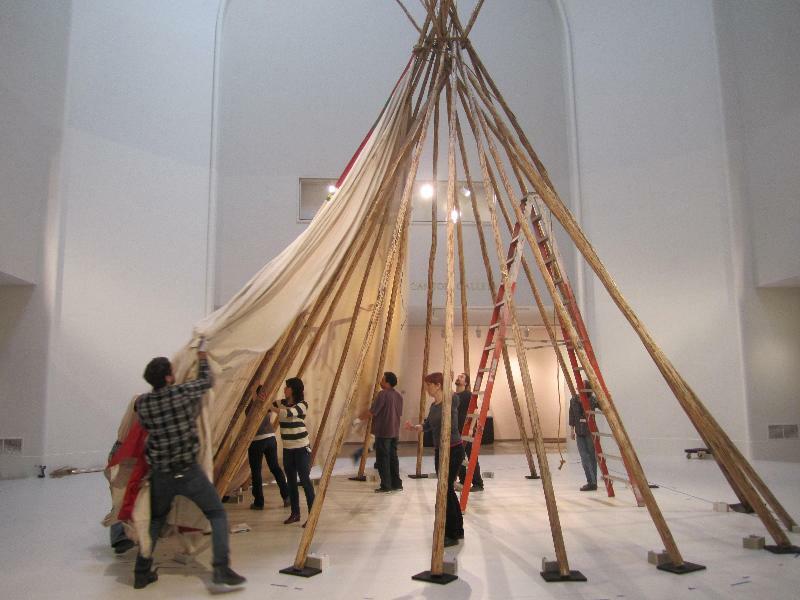 In preparation for the Tipi: Heritage of the Great Plains exhibition, the Brooklyn Museum has assembled a large-scale Blackfeet Welcome Tipi. The tipi cover was painted by Lyle Heavy Runner and visitors will be invited to enter when the exhibit opens February 18–May 15. The tipi cover weighs over 300 pounds and each pole (made of pine wood) weighs about 50 pounds. The tipi is 27 feet tall. The exhibition includes objects from a large number of tribes from the Northern, Central, and Southern Plains. It explores the role of women, who were the owners and makers of the tipi itself as well the furnishings, clothing, and accessories kept within it; the traditional role of men as warriors, whose military exploits are depicted on tipi covers and liners; and the tipi as the center of childhood and family life. On February 3, Brooklyn Borough President Marty Markowitz was joined by Deputy Borough President Yvonne Graham, Mayor Michael Bloomberg, other elected officials and hundreds of guests and honorees for the 2011 State of the Borough Address at Sunset Park High School. BP Markowitz entered the auditorium riding his “senior cycle” on an auditorium “bike lane,” and during the Address reiterated his opposition to the Prospect Park West bike lane, but overall support of bike lanes, where appropriate. Business “incubator” to create jobs in Central Brooklyn. The New York City Economic Development Corporation (NYEDC) is issuing a Request for Proposal (EFP) for qualified individuals, organizations or companies to develop, operate and maintain an incubator space funded by more than $1 million of the borough president’s capital budget—preferably with a food-related use such as food manufacturing, storage or shared commercial kitchen space—in either the neighborhoods of Bedford-Stuyvesant, Brownsville, East New York or Crown Heights, or within a portion of the Moore Street Market in East Williamsburg. Pledge of capital funds for IBM school at Paul Robeson High School. BP Markowitz pledged capital funds (amount to be determined) to assist with the proposed technology-themed high school to be underwritten by IBM and located at Paul Robeson High School in North Crown Heights. In addition to high school curriculum, students will complete two years of college under a program designed by the New York City College of Technology. BP Markowitz fought the Department of Education’s plan to close Paul Robeson High School last year. The 2011 Strategic Policy Statement. Borough presidents are mandated by the City Charter to present a Strategic Policy Statement every four years. In his 2011 vision for Brooklyn, BP Markowitz outlines his goals in the areas of arts and culture; constituent services; economic development; education and libraries; health; housing; parks and recreation; public safety and criminal justice; and transportation and transit. To view or download the complete Strategic Policy Statement with executive summary, visit www.brooklyn-usa.org. Loew’s Kings Theater update. BP Markowitz announced that renovation work is underway at the famed Loew’s Kings in Flatbush. Relocating Panasonic headquarters to Brooklyn. BP Markowitz called on Panasonic to relocate its headquarters and hundreds of jobs from Secaucus, New Jersey to Brooklyn. Improving the Gowanus Expressway. With emissions causing high rates of asthma and traffic backups along its entire stretch, the Gowanus Expressway needs improvements, and BP Markowitz urged action sooner than later to redesign the artery. Other highlights of 2010 included construction beginning on Barclays Center; the opening up of the Municipal Building at 210 Joralemon Street to retail; new retailers coming to Fulton Mall and new hotels in the borough; progress on converting the Domino Sugar refinery in Williamsburg into residential units as well as transforming Fourth Avenue into what BP Markowitz envisions as a grand “Brooklyn Boulevard”; the opening of Piers 1 and 6 at Brooklyn Bridge Park; groundbreaking at the BioBAT bioscience facility at the Brooklyn Army Terminal; a new future for Coney Island; and nearly 15 million visitors to Brooklyn attractions last year. BP Markowitz poked some fun at meeting Beyoncé and supermodels Christy Turlington-Burns and Brooklyn Decker in 2010, including the photo spread of him and Ms. Decker that appeared in the New York Post Page Six Magazine. The State of the Borough Address also celebrated community leaders and Brooklynites with the “Brooklyn attitude,” including hero NYPD Detective Feris “Jonesy” Jones; 96-year-old Cub Scout pack leader Adele Trapp of Crown Heights; Maddalena and Fortunato Corso of Bensonhurst, married 70 years; Matthew Turner and Emily Grant, husband-and-wife Marines from Brooklyn Heights who met and fell in love while serving in Fallujah; the Brooklyn Community Foundation “Do-Gooders” honorees; hero EMTs Delano Williams and Rheinhold Danglade; Alice Sena of Bay Ridge, who rescued 74 wedding gowns from a fire at her store, Sposabella; Robin Rogers of Williamsburg, whose called-off wedding turned into a fundraiser for a neighborhood soup kitchen; and Brooklyn Rhodes Scholars Zachary Frankel and Zujaja Tauqeer. The borough president also paid tribute to Brooklynites lost in 2010, including Saul Bruckner, founding principal of Edward R. Murrow High School; Bernard Catcher, public servant and Democratic Party leader; Dr. Henry Frank, former consul general of Haiti; Dr. Harvey Garner, former New York City Schools Chancellor and longtime superintendent of District 18; Lena Horne, Bedford-Stuyvesant-born Grammy, Emmy and Tony-winning singer, actress and civil rights activist; Johnny Maestro, lead singer of the Brooklyn Bridge; Reggie Nero, who taught valuable lessons to kids through sports at Wingate Field; Jerry O’Shea, longtime executive director of the Flatbush Tenants Council; Paul Podhaizer, president of the Brightwater Towers Tenants Association; William “Bill” Saunders, former state committee member and district leader of the 57th Assembly District; and Congressman Stephen J. Solarz, who represented Brooklyn for 18 years. We found this wonderful 1948 photo of 70 Clark Street (at the corner of Clark and Henry in Brooklyn Heights), by the Wurts Brothers, in the collection of the Museum of the City of New York (MCNY). We had been told by old-timers that there was a drug store with a soda fountain at that corner and this photo confirms that it was called Parker Drugs Luncheonette. This is where Clark's Restaurant is today. The nice thing about the MCNY photo is that you can zoom in on the details and see what was selling in the drug store (Life Magazine, biologicals), along with the coming-soon Rand gift shop around the corner on Clark (blanket, 47 cents!) and -- guess what? - Towne Liquor Store! across the street from where it now stands. The same corner more or less today, taken by Google. Note what a difference the trees make. 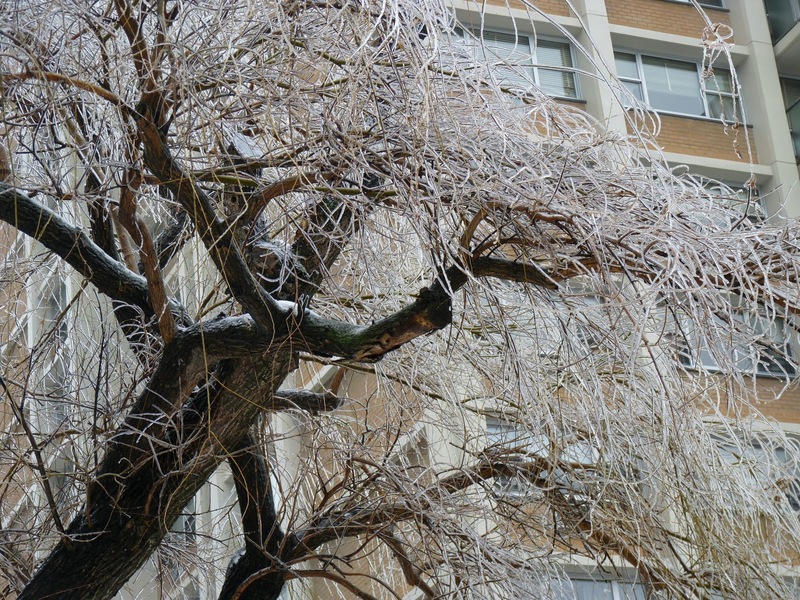 Early yesterday, ice coated the branches of this willow tree growing on Cadman Plaza West in Brooklyn Heights, creating a beautiful ice sculpture. Each tiny branch was encased in a delicate glass-like sheath. 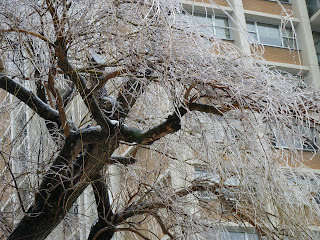 Around 10 a.m. (as it warmed up), the ice coatings starting plunging to the ground, creating a weird ice-projectile rain. 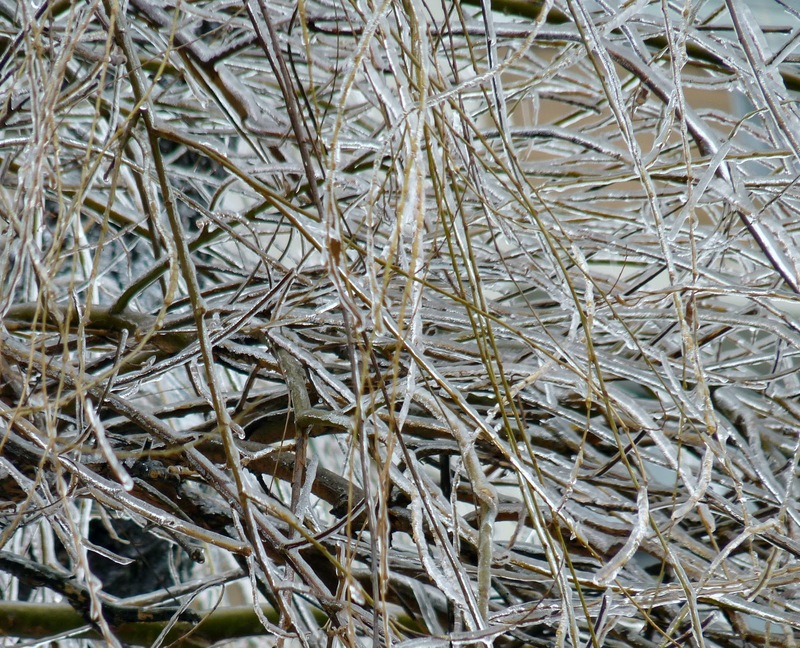 You could hear the hollow arrows of ice clattering as they hit the brittle snow. What new wonders await us today? 350 Customers Without Power in Brooklyn Wednesday P.M. 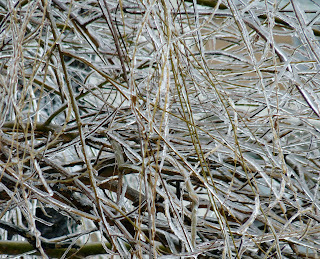 The severe weather -- ice, snow, sleet and rain -- disrupted power to hundreds of thousands across the U.S. today. In Brooklyn, roughly 350 customers were still in the dark as of 7:30 p.m. Wednesday evening, according to Con Edison. Each cluster of colorful triangles above represent multiple outages. Green triangles represent one building without power. If you want to report an electrical emergency, such as a fallen wire, call 1-800-75-CONED (1-800-752-6633). Across the U.S., the weather caused outages at 18 large-scale plants, according to the Wall Street Journal. BLACK ICE WILL DEVELOP TONIGHT AS TEMPERATURES DROP TO BELOW FREEZING...ESPECIALLY ON UNTREATED ROADS AND WALKWAYS WITH REFREEZING OF BOTH STANDING WATER AND MELTED SNOW. MOTORISTS SHOULD EXERCISE EXTREME CAUTION AND ALLOW FOR EXTRA DISTANCE WHILE DRIVING SINCE ROADS WILL BE SLIPPERY. Con Edison says it is closely monitoring today's storm, expected to last into Wednesday. The forecast calls for snow, sleet and freezing rain. The mix could cause branches and trees to fall into power lines and knock out electrical service to customers. Customers can report outages and check service restoration at www.conEd.com or by calling 1-800-75CONED. What with all the fuss lately about what should be done with the iconic Tobacco Warehouse in DUMBO, we thought it'd be fun to see what the place looked like when it had a roof. This 1936 photo by Bernice Abbott, above, shows the Tobacco Warehouse to the right -- much taller than it is today. The partially constructed building in the background is the Purchase Building, which was knocked down a couple of years ago. The Brooklyn Bridge soars overhead, just as it does today. This photo can be seen and zoomed in on at the web site of the Museum of the City of New York. 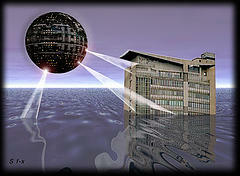 The same scene in modern times, taken by Google. A green fence (now replaced with chain link) surrounds the area where the Purchase Building stood. 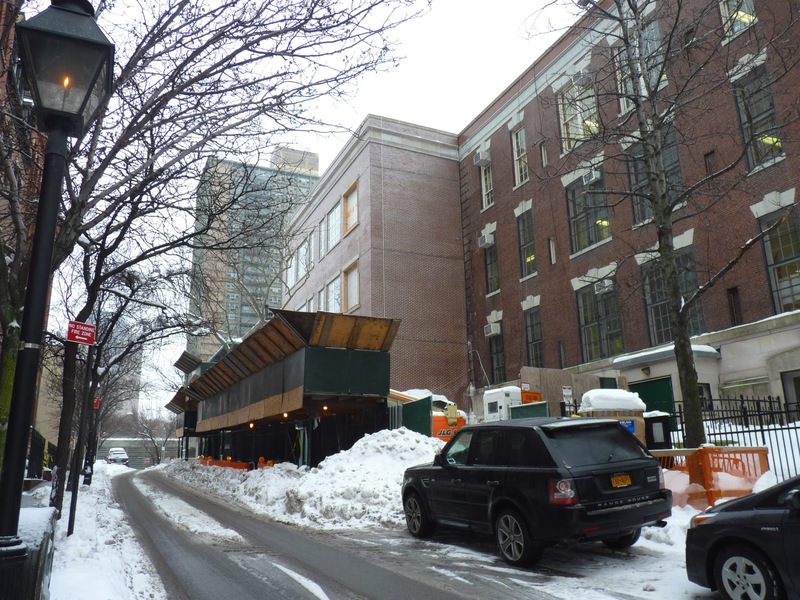 The Brooklyn Heights Association, the Fulton Ferry Landing Association, and the New York Landmarks Conservancy filed two lawsuits in mid-January to prevent the Tobacco Warehouse's removal from public parkland. Documents they obtained through the Freedom of Information Law showed that City and State officials had removed the Tobacco Warehouse from the park’s map so that it could be developed by Saint Ann's Warehouse, a private arts organization. Last Thursday, in a victory (at least temporarily) for the civic groups, the Department of Justice ordered the City of New York to treat the Tobacco Warehouse "as if it were again fully protected federal land." (See Brownstoner for more on this).